Is to:communication back in business? Back from an extensive holiday? Nope – to:communication is back where it all started: the historical city of Mechelen. After dwelling for a few years in Zaventem and the center of Brussels we stumbled on an excellent opportunity. With a diverse range of shops – from popups, independent stores, where some are run by 3rd-generation family members to even the traditional High Street Stores: Mechelen has something for everyone. With more than 330 UNESCO world heritage listed buildings and a wide range of Art, Music and Creative events regularly held throughout the year. For sure, a creative (and strategic) city for to:communication? A town suited for young, old, travelers and…. business people (of course, we focus on the last group). The excellent connections for transport, only 11 minutes from the national Airport of Belgium, the new Central Station project, situated between Brussels & Antwerp … Mechelen is easily accessible for any form of traveler – business or pleasure. Since a balance between business and pleasure is an ingredient for creativity, we decided to move the agency to Mechelen. Why? The big renovation project of the old ‘meat-hall’ (‘De Vleeshalle’) drew our attention. It will become the new ‘taste-market’ (smaakmarkt) of Mechelen. A creative hub where people can meet & eat. Pleasure: on the ground floor, a group of carefully selected foodies – a cheesemaker, Mexican food, Lebanese street food, coffee & tea shop, a beekeeper, Italian & Asian food, … mixed with some meeting spots and a central bar (of course, you will also be able to taste a product from one of our clients: ‘MR’-gin). Business: on the top floors you will find an Antwerp co-working agency, a lawyer, a coaching agency and… to:communication. The renovation had some bumpy roads, but as of October ’18 we will move to our new location! Our clients (and prospects) will love it – they will even want to plan every meeting in Mechelen from now on (around lunchtime, I guess 😊). Even with only a few months left before moving offices, we decided to open a popup in Mechelen. A place where we can work and meet! 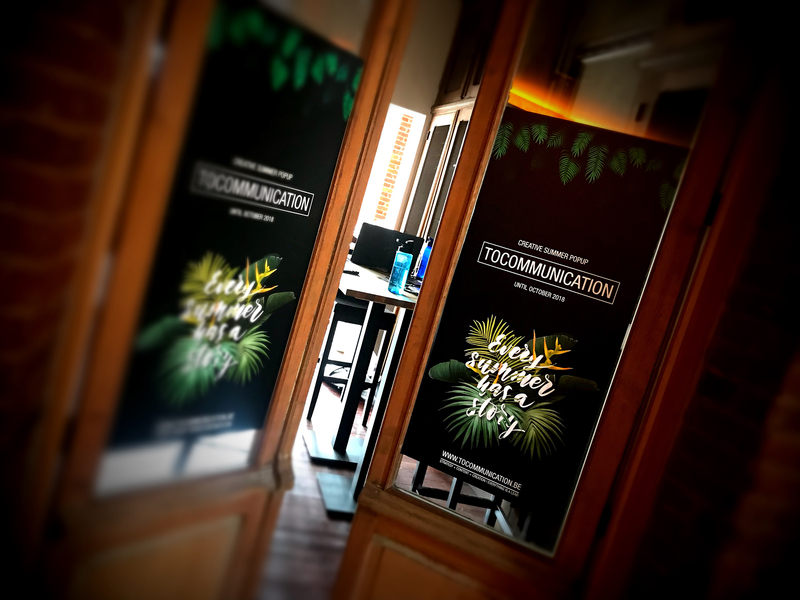 This way we are already acclimatized to our new creative spot, and of course this is also an opportunity to meet some new (local) business people. We got the flavour! You? We can’t wait to move to the new ‘Vleeshalle / Smaakmarkt’! But we also can’t wait to meet you! If you are looking for a strategic & creative agency: contact us!